Each year the Alex-Motsch-Prize is awarded for the best work in the field of functional theory, diagnostic and therapy in dentistry. Ralf Bürgers received this award for his research project on "Tinnitus patients with craniomandibular dysfunctions (CMD)"
The Tinnitus Research Initiative thanks all participants for their active and constructive contribution! Grand Opening on April 22th, 2009. Tinnitus: a CNS disorder. Opportunities and needs of a big market. 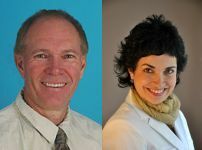 Richard Tyler and Claudia Coelho received the Editor's Award of the American Journal of Audiology for the best publication in 2008. The paper on "Identifying tinnitus subgroups with cluster analysis" meets the highest quality standards in research design, presentation, and impact for the given year. It is truly a high honor for Richard Tyler and Claudia Coelho together with their coauthors Pan Tao, Haihong Ji, William Noble, Anne K. Gehringer and Stephanie A. Gogel. Winfried Schlee received the Award of the Schmieder Foundation 2008 for his dissertation on tinnitus research "Towards a Global Model of Tinnitus Perception: Multiple Evidence for a Long-Range Cortical Tinnitus Network"
Winfried Schlee received the Young Investigator Award for his excellent presentation of the TRI-funded work about "Directed Coherence in the Resting Tinnitus Brain" during the "International Conference on Biomagnetism" (Biomag). Biomag is the most important specialized meeting in the field of magnetoencephalography (MEG). Therefore this award is a high scientific acknowledgment for Winfried Schlee and his coworkers T. Hartmann, N. Müller, I. Lorenz, S. Dalal and N. Weisz. Ana Belén Elgoyhen, leader of the Pharmacological Workgroup, published in a recent issue of PLOS Biology, that a genetically modified cholinergic receptor in the inner ear can enhance noise protecion by the sound limiting system in the inner ear. The encouraging news is, that there is a real chance of finding ear-specific drugs for preventing noise trauma and tinnitus in the future: "A Point Mutation in the Hair Cell Nicotinic Cholinergic Receptor Prolongs Cochlear Inhibition and Enhances Noise Protection". Read about Ana Belén Elgoyhen, leader of the Pharmacological Workgroup, who is the Laureate 2008 for Latin America of the "L'oreal UNESCO for women in Science awards"
Among others Ana Belén has been interviewed about Tinnitus for Perfil, an argentine newspaper. Dr Ronald John GOODEY, of Auckland. 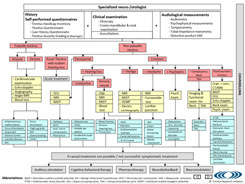 For services to otolaryngology." We invite you to read the article "Doctor humbled by New Year honour" in the "East And Bays Courier", which describes work and inspiration of the ear, nose and throat specialist Dr. Ronald Goodey.